So there were were at the office one night, wondering where to have dinner. Sometimes when you always eat out, you get tired of the same fastfood joints and restaurants. Yes, don't get me started on how unhealthy it can be to always be ingesting fastfood stuff. That night though, we decided to try something new. What that thing is, we didn't know yet. But we were tight on budget so an economical meal was in order. Dinner on a tight budget? 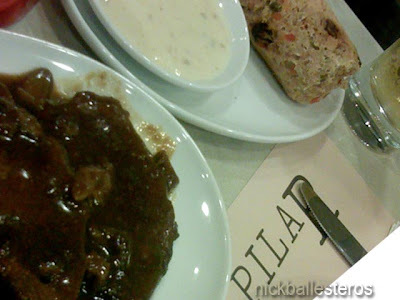 What came to mind was the ever-reliable carinderia, where you can have small but fulfilling portions of meat, veggies, and rice and shell out less than a hundred pesos for it. 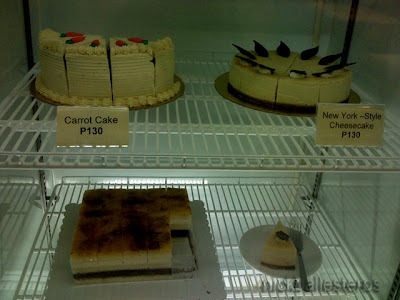 So I Googled "Makati Carinderia". Anton Diaz's famous blog with an article for Petra & Pilar came out on top. The photos revealed that this was not your ordinary carinderia but we were intrigued by the name and so off we went for dinner to this place. 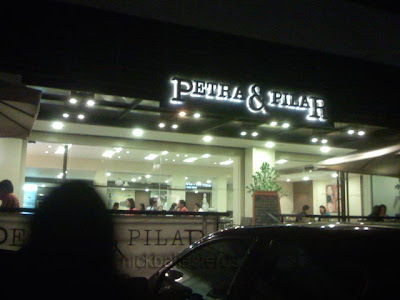 Petra & Pilar is located near the outskirts of the business district, and yet it exudes a Greenbeltesque atmosphere. Outside are generously distributed tables and chairs, and the main dining area is brightly-lit, airy, and spacious. And in the manner akin to carinderias, food is laid-out in trays and you fall in line to order. The food is served to your table, though. While waiting for our food to arrive, we chatted with the staff and learned that Petra & Pilar are actually the names of the mothers of Senator Enrile and his wife, respectively. Interesting trivia, eh? 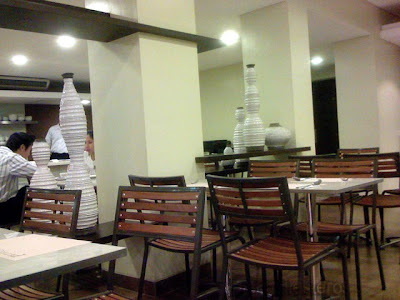 So that's why the restaurant is located at the Jaka Building, which the Enrile family owns. 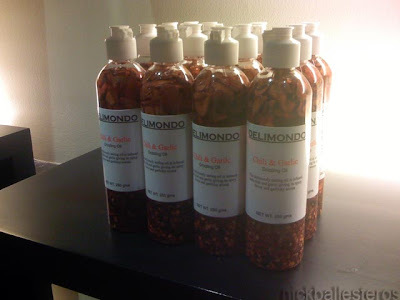 Inside the restaurant is the Delimondo store, which specializes in flavored oils, wines, preserved meats, and reputably the best corned beef in town. And the food? One word: wonderful! 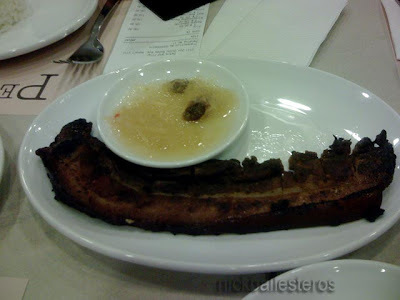 This is their pork binagoongan. This dish usually borders on the salty side owing to the generous amount of bagoong (shrimp paste) that the recipe calls for. 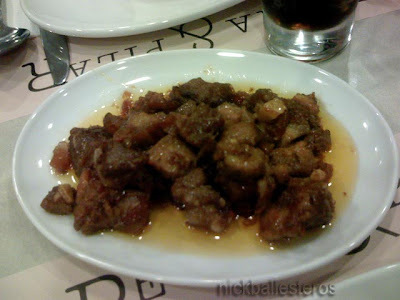 However, Patre & Pilar's version was delicately sweet and salty at the same time, the flavors playing a medley in your mouth as you chew on the pork bits. Awesome dish. 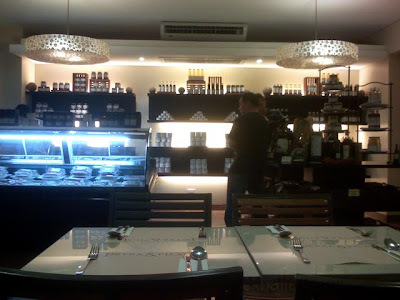 About the only other time I marveled at how a simple dish can taste so great was some four years ago at the Fairways and Blue Waters in Boracay where the chef cooked sumptious adobo for us. But I digress. Inihaw na liempo. I was wondering where the soy sauce with calamansi dip is, but my companions said that for this one, you dip the liempo onto the atchara. I thought they were pulling my leg but they proceeded to do so. The liempo was well done, but the atchara dip was not for me. We also had Beef Mushroom Kalitiran and Bangus Embotido. The beef mushroom has a sweet, tangy sauce and was wonderful bite. The bangus embotido was fulfilling as well. Cheesecake, anyone? We were so full already that we no longer ordered dessert. These beautiful creations will have to wait another time. After dinner, we snooped around Delimondo and grabbed some corned beef and sausages which our trusty friend and cook extraordinaire Janice prepared for breakfast the following day. We arrived at the office earlier than usual to share breakfast. Yup, the corned beef was indeed scrumptious. Janice likes her corned beef watery; I prefer the dry version, though. Still, Janice did justice to the corned beef. We had one heavy breakfast! 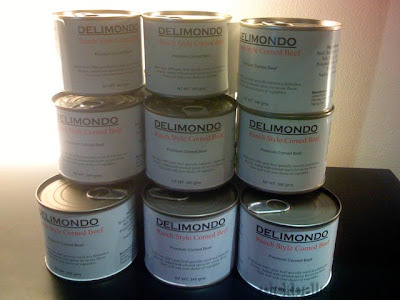 I brought a couple of cans to Baguio to give to my Tatay who loves corned beef, and an extra can for cooking at home. I will share my wife's super-easy recipe at a later time. Our hearty dinner amounted to 750 pesos (with drinks). So much for trying to save up ! Hahaha. But nobody was complaining; it was well worth it. 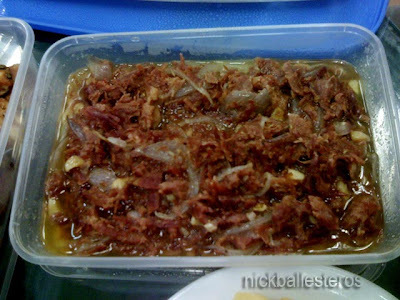 The corned beef costs 100 pesos per can.